The Israel-Lebanon/Hezbollah War—(July 12, 2006-August 14, 2006): The latest chapter in the ongoing Arab-Israeli Conflict began on July 12, 2006, when guerillas from the Islamic Lebanese group, Hezbollah (Arabic for "Party of God), crossed into Israel and attacked an Israeli Defense Force (IDF) patrol, killing three and capturing two others. They then returned to southern Lebanon with their prisoners. Hezbollah's leader, Hassan Nasrallah, said the men were taken in order to set up a prisoner exchange with Israel. Israel's Prime Minister, Ehud Olmert, declared the attack an "act of war" on Lebanon's part, and promised a strong response. In Lebanon, this war is known as the "July War," while many Israelis call it the "Second Lebanon War." Hezbollah launched "Operation True Promise" at 9:05 AM, on July 12, 2006. The operation began with a diversionary attack of rockets and mortar shells fired at Israeli settlements and military posts near the Israel-Lebanon border. Hezbollah troops then entered Israel, attacked two armored Israeli Humvees, patrolling the border village of Zar'it, with rocket propelled grenades, killing three soldiers and capturing two others. The Hezbollah force then retreated back into Lebanon with their captives, later identified as Ehud Goldwasser and Eldad Regev. 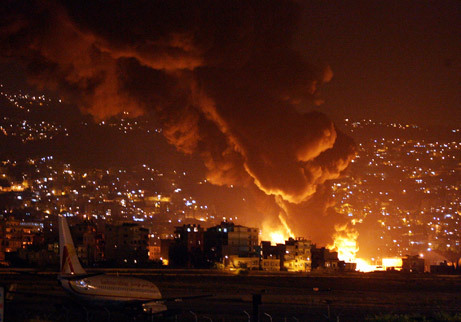 After Hezbollah's cross-border raid, the Israeli military launched air, naval, and ground attacks at Hezbollah targets across Lebanon, and Hezbollah responded by launching hundreds of rockets into northern Israel, many reaching as far south as the port city of Haifa. Hezbollah also damaged an Israeli warship ten miles off the Lebanese coast with an Iranian-made unmanned drone, which rammed the ship and exploded. Both sides continued to trade rocket, missile, and, artillery attacks, with most of the damage done to civilian targets on either side of the border. Israel's strategy seems to be to cut off Lebanon and Hezbollah from any aid they may receive from Syria or Iran, who are Hezbollah's main suppliers of weapons, money, and military training. For a trans-border Arab-Israeli war, this conflict was different than most. Israel at first responded lightly in the ground war, apparently relying on the air and artillery campaign to inflict most of the damage. Hezbollah responded with wave after wave of rockets and missiles supplied largely by Syria and Iran over the past several years. Some of the larger Hezbollah rockets were able to strike the Israeli port city of Haifa, inflicting damage and causing civilian casualties. The Israeli strategy seemed two-fold: cut off Hezbollah from its suppliers and allies in Syria and Iran, while also striking Lebanese infrastructure targets with no apparent connection to Hezbollah. Israel hoped to show the Lebanese government and people that Hezbollah brought death and destruction to their county, hoping that this lesson would turn popular opinion against the Shiite militia. The opposite effect seems to have taken hold, however, with most Lebanese Muslims increasing their approval or outright support for Hezbollah, while even Lebanese Christians, normally not friendly to Islamic parties or militias, blamed Israel for attacking civilian targets as an act of punishment. While this political and psychological goal failed, Israel also failed to stop Hezbollah rocket attacks on Israeli cities and towns. The air campaign did not work in terms of increasing Israeli civilian safety during the war. The ground campaign also seemed lacking. Unlike past wars, such as the 1956 war against Egypt or the 1967 war against Egypt, Syria and Jordan, or the 1982 invasion of Lebanon, the Israeli military did not immediately launch powerful assaults on the ground to root out and destroy their foes. Ground attacks did occur, largely from the second week on, but these were individual assaults to take or neutralize specific targets fairly close to the border. One significant commando assault did take place in the northeastern Lebanese city of Baalbeck, but that was designed as a specific attack to seize individual Hezbollah leaders. Only in the days leading up the United Nations-brokered cease-fire in the middle of August did the Israeli military launch a powerful drive which took it to the Litani River in southern Lebanon. On Hezbollah's side, the war showed that their guerillas, though technically only a militia, possessed the training and fighting ability of a well-trained army division. Technologically, they surprised Israel with the depth and range of its missiles. One missile crippled an Israeli naval ship and sank a commercial freighter off the Lebanese coast in the early days of the war. Iranian-made missiles landed as far south as Haifa. For the first time since before the 1967 war, major Israeli civilian population centers came under attack. The war also showed once again that the Lebanese government is helpless to defend its own territory or to keep other countries from fighting proxy wars and conflicts on its land. Just as when the Palestine Liberation Organization (PLO) moved in and took over southern Lebanon in the 1970s to fight its war with Israel, the government shows that it cannot stop Lebanon from being a battleground for others. By August 12, Israel, Lebanon, and Hezbollah all agreed to a United Nations cease-fire to begin on Monday the 14th. This war is a part of the wider Israel-Lebanon Conflict which dates from the first Israeli invasion of Lebanon in 1978. On March 19, 2007, Israel formally declared the 2006 conflict with Lebanon's Hezbollah guerrillas a war, but Israel is searching for a name for the 34-day conflict. On Wednesday July 16 2008, Israel and Hezbollah initiated deal whereby Hezbollah turned over the bodies of the two captured Israeli soldiers, Ehud Goldwasser and Eldad Regev, in exchange for Lebanese prisoner Samir Kuntar, four Hezbollah militants captured during the war, and the bodies of approximately 200 other Lebanese and Palestinian militants held by Israel. This prisoner swap prompted some criticism in Israel, especially after it was learned that Samir Kuntar was one of the released prisoners. Kumar and the other released militants, were greeted by a hero's welcome in Beirut. Al-Manar TV - Hezbollah television station. Live from Lebanon Diaries — "Commentary, analysis, human rights and development information, and diaries from on the ground"